Martec Bronze 2 blade folding. Engine has run 50 Hrs since rebuild. 12 volt, 5 batteries charged by: engine, solar panels, shore power, generator Generator starts but shuts down immediately. Watermaker requires servicing. 2 x Mastervolt 3 step battery chargers, 1 at 100 amps, 1 at 70 amps capacity. 4 pcs 12v 150 amp AGM House batteries and one 65 amp starter battery. Starting forward there is a large forepeak with a deck hatch for storage of sails and cruising equipment. The aft end of this space has a removable Lexan panel that makes this a watertight compartment for long offshore voyages. Next aft is the full width master head followed by the master stateroom with a double bed to starboard, bookshelves, and a settee and hanging locker to port. The cabin if full width and has 2 deck hatches. Just forward of amidships is the full width galley, with lots of light from the overhead skylights. The galley has a two burner gas stove (NEW 2018), a large, sink (new 2018) and there is a dinette to port. This dinette is convertible to a short berth suitable for children. The salon is amidship and is very spacious, with a settee to port and a settee and large table to starboard. The Nav-station aft and to starboard. The engine is located under the companion ladder in a sound box. Aft there are two identical staterooms with double beds aft,with ensuite electric heads (NEW pumps 2018) and vanities. These two staterooms share an amidship shower. All interior lighting, overhead as well as reading lamps, are LED lights. (new 2018) There are 31 interior lights, these are very bright, produce no heat, and only use a total of 2 amps when all are lit. Finally aft is a machinery space under the aft deck which houses the steering, generator and water maker. (water maker working and running, but 2 gauges needs replacement) This has a separate deck hatch, and similar to forward has temporary Lexan panels that can be mounted for watertight integrity for offshore voyages. The floors are teak and holly, with the exception of the heads which are a rubberized non-skid material. The yacht is fully air conditioned with two 10,000BTU units, The air-conditioning is designed only for 240/220v shorepower and is not intended for use at sea. Liferaft and EPIRB require servicing. 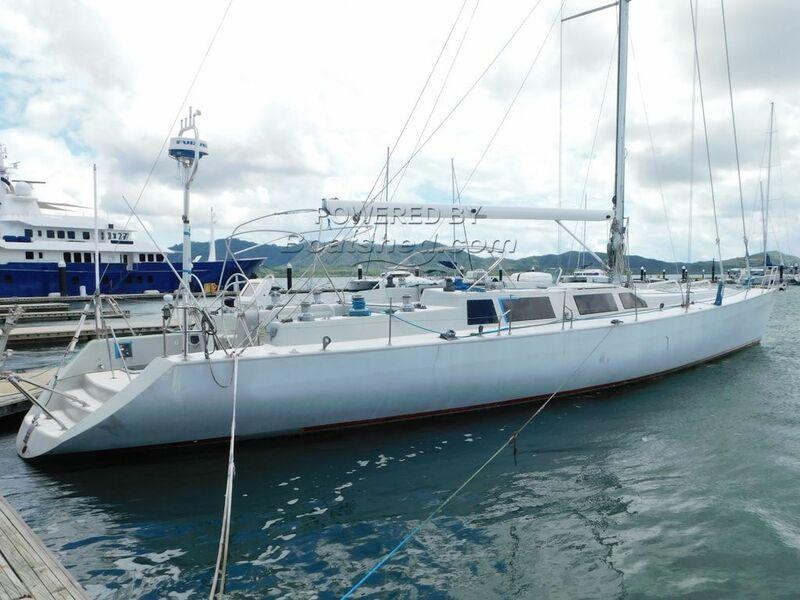 Purchased by her current owner in Fiji in 20111 she was sailed in Indonesia, Thailand, Malaysia etc. But due to an unfortunate change in circumstances she has been unused for some years. She was conceived as a very fast racing yacht, but with a cruising interior for comfort. Designed by Alan Andrews, of “Glory”, “Alchemy” and “Pywackett” racing fame and is offered as an unfinished project. This Andrews Custom 72 Sloop has been personally photographed and viewed by Alan of Boatshed Phuket. Click here for contact details. What was the original name of this yacht?